“A typhoon had temporarily stranded a monkey on an island. In a secure, protected place on the shore, while waiting for the raging waters to recede, he spotted a fish swimming against the current. It seemed obvious to the monkey that the fish was struggling and in need of assistance. Being kind of heart, the monkey resolved to help the fish. A tree precariously dangled over the spot where the fish seemed to be struggling. 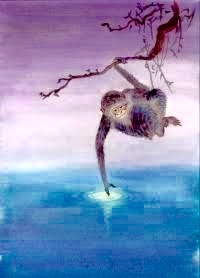 At considerable risk to himself, the monkey moved far out on a limb, reached down and snatched the fish from the threatening waters. Immediately scurrying back to the safety of his shelter, he carefully laid the fish on dry ground. For a few moments the fish showed excitement, but soon settled into a peaceful rest. This is a parable that I heard the other day, and I became fascinated by it. Parables are “a simple story used to illustrate a moral or spiritual lesson”. I have actually been completely enamoured by parables for as long as I can remember. It’s such an art to be able to put together words, and paint a picture in the readers imagination. To make someone think. I love words, and I love stories. More than that, I love hidden meaning behind words. It’s mostly what my whole writing style is based upon. And this particular story had so many hidden meanings to it. I think the most important lesson about this story, is the fact that whilst we think we might know what the best thing is for ourselves, we absolutely have no clue what is good for anyone else. In fact, what might work magnificently for ourselves, can be detrimental to someone else. We may feel as though we are doing the other person a kindness, by doing for them – or merely offering advice on, what would best help us. To be totally honest, a lot of us don’t even know what’s good for ourselves. So how can we possibly think that we have the knowledge, or experience to show anyone else the path to salvation? We only have our own knowledge to draw upon. Our own experiences in which we look to as a point of reference. We have no clue what is good for anyone else. In what the monkey deemed a kindness to the fish, he ultimately destroyed it. Throughout my life, I have experienced this too many times to count. Everyone’s situation is unique to themselves. And sometimes, that’s something that we just don’t possess the capacity to understand. So we have to let it go. Like in how the monkey should have let the fish go. It’s not to say that you should ignore everyone else who you observe in the midst of their struggles, and only concentrate on ourselves. I believe it means that what it would be helpful to educate ourselves about the other person. Because we all have a story. And by actually taking the time to listen to someone else’s story, we not only gain a better understanding of why people do the things that they do, and of why they are the way they are – only then are we able to give the gift of compassion and empathy. Why do we try to control and manipulate others? Why do we try to convince someone else what is good for their own soul? Do you even know what is good for you? Is it a desperate attempt to try to right our own wrongs? Are we living vicariously through someone else? Is it because we have some sort of an ulterior motive, and want something from that person? Why don’t we try and look within, and do what’s good for ourselves? And in doing that, let’s give everyone else a break, and let them do what is going to work for them. Let’s stop making someone else do something that really doesn’t affect our own life. And if it is something that affects your life? Well then, for heavens sake – speak up. Fight for what is right for you. Because all we have is ourselves. And if we are not going to look after ourselves, then we need to know that someone else is sure as hell going to try and pluck us out those proverbial “raging waters”, and try to save us. And potentially put us into a situation that does not serve us in any way whatsoever. Do not take responsibility for anyone else except yourself. But DO try to understand the other person. I quoted the author Anais Nin, in the title of todays article. “You cannot save people, you can only love them”. Loving each other, is all we can offer up in this bizarre lifetime of ours. And I would like to leave you with another quote of hers. About how we do not know what is good for anyone except what is good for ourselves. And that we are only ever reflecting, and projecting.